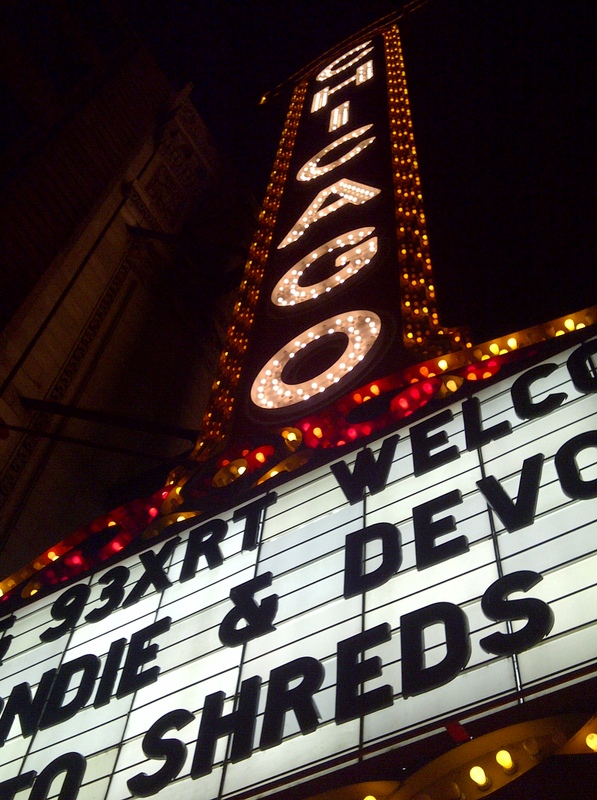 Last night my husband and I went to see the musical show of Blondie and Devo courtesy of WXRT at the Chicago Theater. My lucky hubby won the tickets from the radio station. The tour is called “The Whip it to Shreds” and features Debbie Harry, Clem Burke and Chris Stein, along with newer Blondie band members Leigh Foxx, Tommy Kessler and Matt Katz-Bohen and the original members of Devo, Mark and Bob Mothersbaugh and Gerald and Bob Casale who took the stage with tour drummer Jeff Friedl rounding out the line-up. Debbie Harry blasted on stage wearing her hair bleached blond and wild. Her golden, glittering outfit was covered by a silvery overcoat. 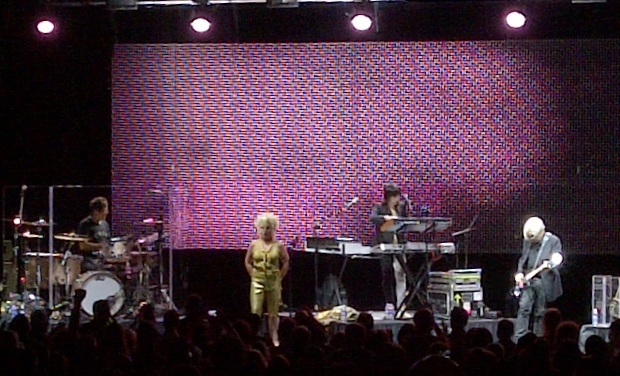 Blondie played many fan favorites, but by the end of the night, Debbie was losing her stamina and her voice. The one song that I wanted to hear, “The Tide is High” never made the set list. At one point, while she was singing “Heart of Glass”, it looked as if she had a crick in her side for she kept holding it as she sang. Even though the crowd stood the whole time she was playing, there was not much dancing or jumping around. I sat through most of it and caught myself up on emails. Her performance was a yawn. After an extra long intermission between Blondie going away and Devo coming on, the lights went down and the members of Devo walked one at a time on to the stage amid loud roars. The crowd was still standing and moving to the punk rock music. The spectacle reminded me of something from the Blue Man Group. It crossed my mind that maybe the Blue Man Group copied from Devo to create their show. Devo’s pinnacle was when they performed “Whip it” and “Satisfaction” back to back. The crowd was revved up and enjoying the show. When the band threw “energy hats” to the audience, the fans went wild, jumping and grabbing to get the free hat. Those hats, priced at $40, were on sale in the lobby. 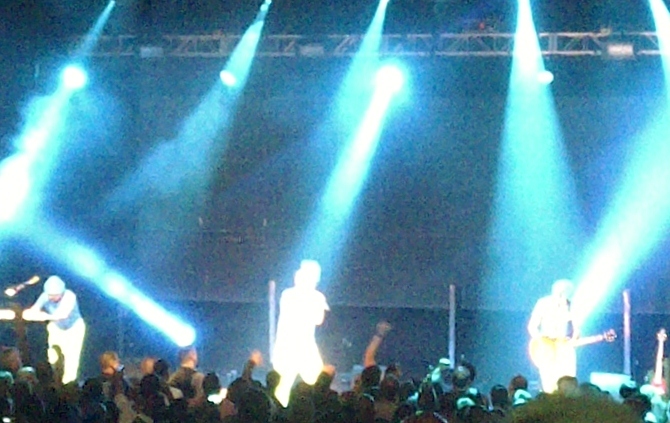 Devo was definitely the hit for the night and made it worth the price of admission. I enjoyed the Devo show. The rocking de-revolutionists made me want to put my phone away, and never looked at it again. Good going, Devo! Posted in Living the Life and tagged Blondie, concert, Devo, entertainment, Grandmother Musings, music, postaday, punk rock music, The Chicago Theater, The Whip it to Shreds Tour. Bookmark the permalink. It sounds like a good show and that you had a good time. Looks like a grand time! Thanks for sharing. Your hubby won the tickets, how cool!